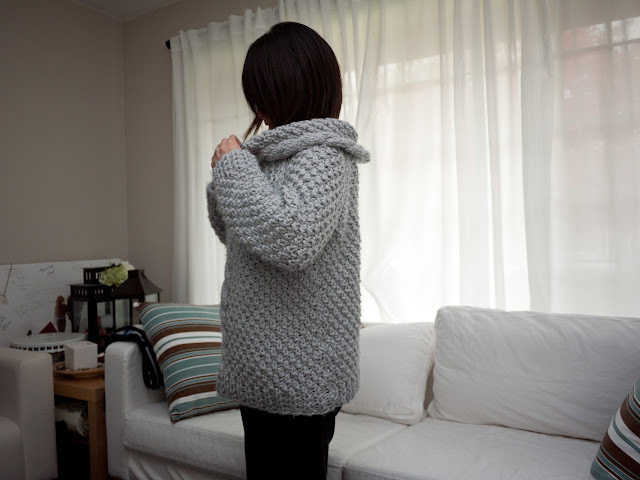 It is chunky (uses size 15 needle), cute (reminds me of something Jacky O might lounge around in) and seems relatively straight forward (pattern had K and P, slip and Ktog, and cable twisting). 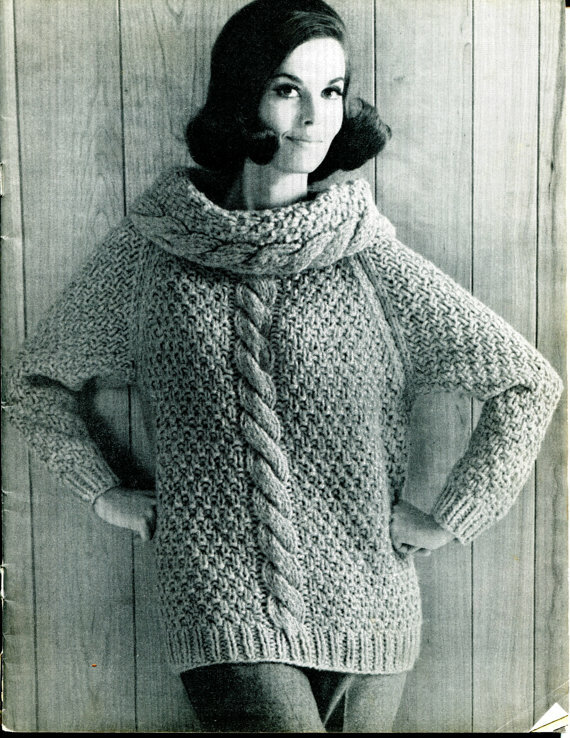 I read somewhere that vintage knitting patterns are hard to do for a beginner, but this one is surprisingly easy. It starts you off in the back & sleeves where there’s no cables, and once you get the hang of the pattern, it was quite easy to follow the cable twisting front instructions. I had to take notes while knitting to keep track of which row I am in though! I made a few modifications to mine. The pattern called for size 13 needles for the ribbed knit, I used 15 since I didnt have long, size 13 needles. I also increased the bodice by 4 rows to make it slightly longer than the sleeves, otherwise they fall at the same length. I used pewter loops and threads cozy wool. 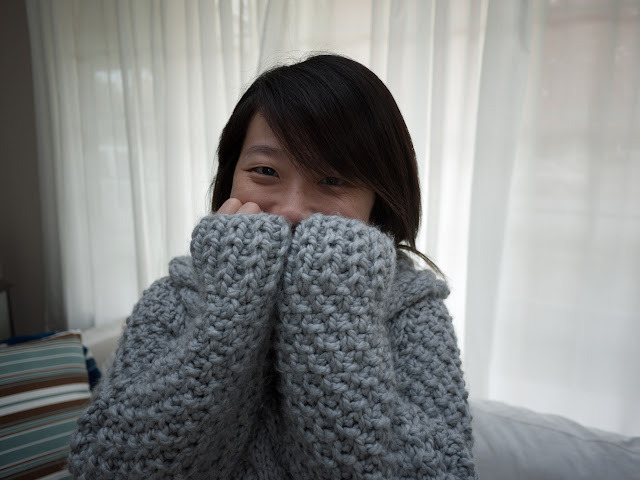 it is 50% wool and 50% polyester, is very fluffy and warm and soft. I think I used a total of 6-7 balls, which end up costing me about 30 dollars. 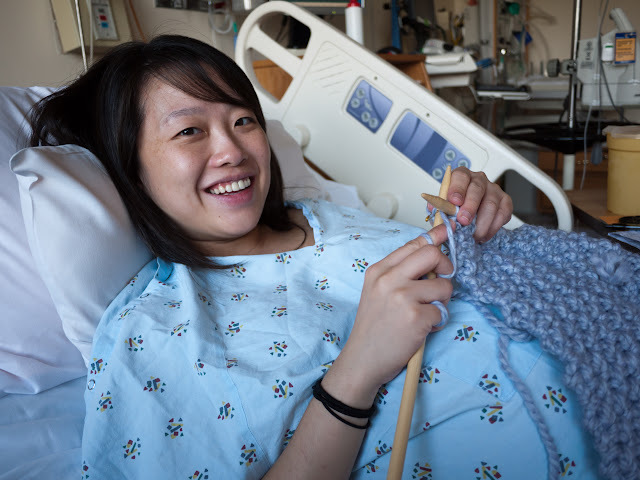 I started knitting this a few days before I went to the hospital to induce labor. While waiting for picotin to kick in (it didnt quite work, they had to break my water manually to start labor 8 hrs later), I was still knitting and finishing the front piece. It did help me not feel the cold iv fluid going into my wrist! Heres how my version looks, I really love it! I had so much fun with it, that I decided to knit another sweater, this time a baby sweater. Hopefully I can finish it soon! Kaylee wants to be held all the time these days so its hard to find moments where I have a pair of free hands! This entry was posted on Friday, November 18th, 2011 at 2:44 pm	and posted in finished pieces. You can follow any responses to this entry through the RSS 2.0 feed. I love it!! It really does look so comfy! 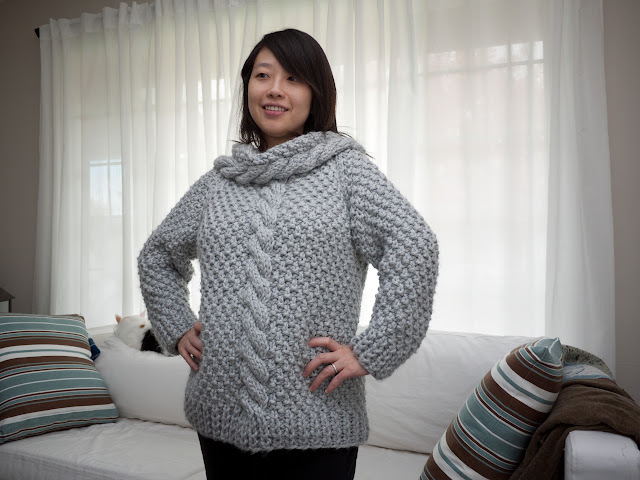 I like the sweater and wish I had one right now for the cold snowy night we’re having! woo! thanks for the tip! I tried putting her in one of her baby carriers when she was fussy, but it didnt quite work. i think it was a little uncomfortable. i checked out mei tei and it looks much more comfier. I might just make one myself as it looks very easy to do — just need to interface it with a lot of fabric! There is a good tutorial at mybeaubaby.blogspot.com and she posted some links to other ones too. They usually cost >$100, so making one would really save! Wonderful! Beautiful color and it looks so comfy and snuggly. That is a beautiful sweater. I am sooooooooooo green with envy. Wow that is beautiful, what a great style. and fits you perfectly. It looks awesome! I have been trying to learn to knit and crochet for five years now and still not very good at it! lol Hopefully one day I will be good enough to make something like this! You did a great job!